What if, in the original movie, Kong didn’t die at the end? What if he survived the fall somehow? The fall and the knowledge that the only lady he loved didn’t love him and the fact that half of the entire city of New York had seen his weiner (from both a distance and up close and unconsciously personal) because he’d been abducted against his Kong-will and wasn’t adequately packed for life in a big city/he didn’t have any pants on/I don’t have any pants on/We’ve all found ourselves inadequately packed for the city at one point or another in our lives/let’s move on. Ah, but that’s the thing now, ain’t it. Kong can’t move on! And that’s what this Skull Island thing’s all about. 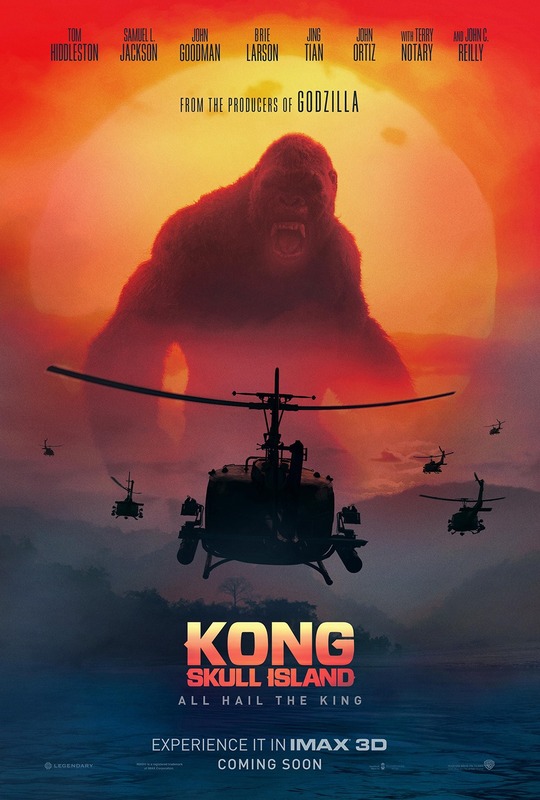 Say Kong survived the fall. Say he managed to crawl his way out of the city un-re-captured and booked passage on a crab fishing boat of some kind working odd jobs here and there at sea until he eventually made it back to Skull Island. Say he made it home and now it’s 40 years later and he’s spent the entire time eating octopus, staring at a lake like it was Netflix, and missing the girl he’s still hung up on and will always love. That’s where we find our hero in Skull Island. We find a post-lost-love Kong mangled by the effects of all those years that have followed the loss. We find a Kong alive in a world that at all times holds its stomach in like it’s trying to pick a fight. The metaphor has been shifted to the island in this one. The island is lost love. This is what the world looks like post losing your Helen. Lost love is an island full of loneliness and terror and monsters that must be fought daily. And Kong fights them. Because that’s what we have to do. Oblivion is inevitable and also oblivion is not an option. And even on Skull Island, as hopeless as it is, not everything is inevitably hopeless. There’s a small group of natives that are still alive on the island, a small group of natives and John C Reilly, a small group of natives and John C Reilly who still have a shot at this. They are born and then they die but between all of that they fall in love. Even on an island that represents a post-love nightmare, there’s still love. And this new Kong can relate to that. So he protects it. He’s re-dedicated his post-Helen years to protecting the love that’s still out there. And when he’s not doing that he eats octopus and stares at lakes like he’s watching Netflix while wishing that Fay Wray’s happy out there, somewhere, wherever she is. Because that’s all Kong really wanted from her. To be happy. He wanted her to be happy. That’s what this new Kong wants from everyone. That’s what this new Kong movie’s all about. Kong wants you to fall in love. Kong wants you to be happy. And he’s willing to go on fighting inside his own nightmare because of this. He’s still willing to fight for it. Because Kong knows what something like that feels like. Because Kong still remembers like we all still remember. For a couple of million minutes or something like that, Kong was happy too.